Ask anyone to describe a beautiful vehicle, and you’re likely to hear about sleek new models or vintage roadsters. Across the U.S., however, intrepid artists have used highway toss-offs to create works of art. Way out west, in the dry desert heat of Amarillo, Texas, lies one of the most beautiful examples of automotive art in the country. This piece features a straight line of old, brightly colored used cars protruding out of the flat desert ground, tail end up, with their hoods completely buried in the sand. The piece was installed by artists Chip Lord, Hudson Marquez, and Doug Michels under the moniker of their alternative architectural group, Art Farm. The sculpture is meant to illustrate both the emergence and disappearance of the iconic “tailfin” feature that was included in the design of certain cars made between the years of 1943 and 1964. Marquez noted that the inspiration for the project was spawned from a children’s book that he and Lord found in a bar while living in San Francisco. 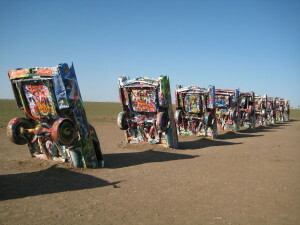 The vibrant row of vehicles is visible from the frontage road of Interstate 40, just westbound of Amarillo. They allegedly stick out of the ground at the same angle as the Great Pyramid of Giza in Egypt. In the late 1960’s through the mid 1970’s, when vans were still a hot commodity in the automotive industry, an artist by the name of “Greg of Akron” had a vision for transforming the bland paint jobs on these vehicles into something more colorful and unique. He accomplished this by covering them in massive, one-of-a-kind murals for his pleasure and that of his customers alike. Greg of Akron, who preferred not to use his last name for incorporation purposes, rose to artistic fame through his larger than life airbrushed paint jobs, which he performed on used cars in his Norton, Ohio studio. Greg, who was formerly a construction worker, painted thousands of vehicles in his career, from drag racers to motorcycles. However, his most notable work of art is a vibrant yellow and red mural entitled “Flying Eagle,” which was completed in 1975 on a black van. 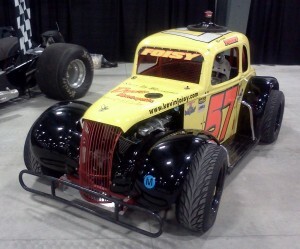 In that year alone, his business grossed $500,000 from custom paint jobs. Greg of Akron passed away in 2007, but his legacy is certainly alive well. Alexander Calder is an extremely well known and coveted artist, primarily know for his moving sculptures, called “mobiles.” What many people might not know about Calder is that he was the first person to be commissioned to paint professional race cars. In 1975, French racer Herve Poulain had the idea of combining the physical intensity of endurance auto racing and the emotional delicacy of the visual arts. The racer approached Calder with the idea of painting his car for an upcoming race, to which Calder agreed. The artist created an eye-catching, geometric design composed of large red, yellow, blue, and white fragments that would change the way people looked at racing designs. Other famous artists, like Andy Warhol, Roy Lichtenstein, and David Hockney would go on to paint racing automobiles as well. In fact, artists today are continuing the trend on all types of vehicles, from used cars to motor homes. Through their various projects, artists like the above have illustrated how vehicles can be used to take people to both physical and emotional destinations. When they’re shopping for used cars, West Springfield, MA drivers should check out the selection at http://www.fathers-sonsvw.com/index.htm.